Daniel Ricciardo upstaged his Red Bull team mate Max Verstappen with a dazzling record lap in the final seconds of Saturday's thrilling qualifying shootout for the Mexican Grand Prix, as the title-chasing Lewis Hamilton took third. After seeing his young Dutch teammate dominate every practice session, the Renault-bound Australian produced a stunning riposte as he took pole and Red Bull swept the front row of the grid. It was their first lockout since the United States Grand Prix in 2013 and on a day that record-breaking speed gave them the initiative for a race won by Verstappen last year. World championship leader Hamilton, seeking to clinch his fifth drivers' title, was third for Mercedes ahead of his only rival Sebastian Vettel of Ferrari, with Valtteri Bottas fifth in the second Mercedes and Kimi Raikkonen sixth. German Nico Hulkenberg was seventh ahead of his Renault team mate Carlos Sainz and the two Saubers of Charles Leclerc and Marcus Ericsson. Verstappen had been hoping to become the youngest pole-sitter in F1 history and was clearly disappointed at being outpaced by Ricciardo. "Thanks, legends," shouted a wildly happy Ricciardo over team radio before adding later: "I knew it was in there somewhere -- I just knew the pace was in the car... Shout out to the team to get a one-two." Verstappen could not hide his feelings as he made a gentle collision with a number board as he parked his car. "The whole qualifying was crap," he said. 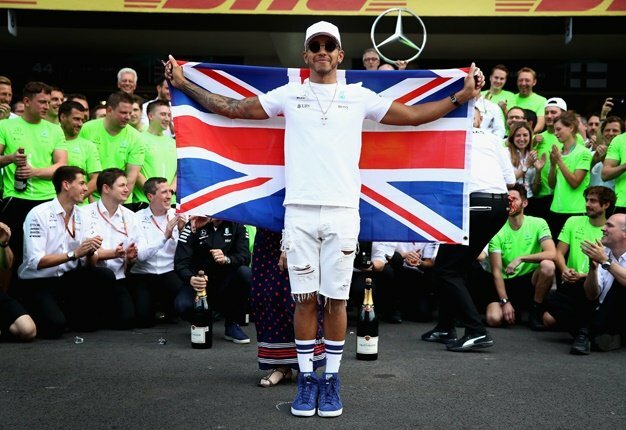 Hamilton, who only needs to finish seventh to secure the championship, was satisfied with third. "I am really happy with it," he said. "We had a difficult day yesterday and it was a big improvement."